Spiritual Centering centres you and connects you with your inner core. It brings you into alignment with your life path. 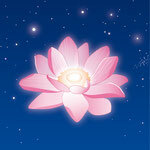 Spiritual Centering helps you to recognise what belongs to you and what does not. No matter what is going on in the outside world it helps you to remain calm and at peace. This essence helps you to learn to focus on your own inner centre where you can gain clarity to help you make decisions; thus strengthening your confidence to follow your life path. Bring the essence with your arm stretched out in front of your solarplexus chakra slowly towards your solarplexus chakra. Do the same from the right side, from the back and from the left side. Lead the essence with your arm stretched out on the level of your solarplexus chakra clockwise around your body; then with about 40 cm distance to your body and then with about 5 cm distance to your body. Apply one drop on the front and back of your solarplexus chakra. Place the essence for a moment between your feet, and then slowly lead it close to your body upwards until above the head, hold it there for a moment and then bring it slowly in front of the heart chakra where you also hold it for a moment. Apply one drop on your heart chakra. Apply one drop on your middle finger and apply it on your body from your solarplexus chakra up to the heart chakra. Rub 3 drops between your palms and place your hands on your spleen and liver. Apply one drop with your right hand on your upper belly by making clockwise movements on your belly. 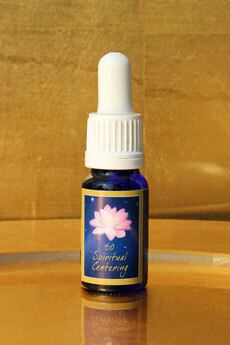 Apply 3 drops between your palms, place your hands on your kidneys until the energy has been absorbed. Finally, take one drop under the tongue.